The aim of the project is to examine and implement strategies that would enhance the Acadia National Park visitor experience by utilizing online networks such as iNaturalist.org, Encyclopedia of Life (EoL.org) eBird.org, etc. By exposing visitors to online Citizen Science resources with large interpretation inventories containing images, videos, sounds, maps, and classifications, the WPI team intends to engage park visitors in meaningful and directed activities. This would include creating collections, starting and joining online communities, sharing species images and taking part in a vibrant and ever-expanding network for those interested in nature and the environment. The WPI team believes that a better visitor experience is achieved through pre-planning and access to educational and interpretative resources. 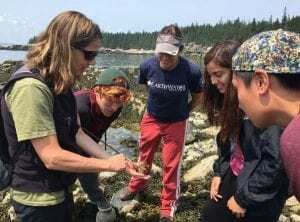 Self-guided and group-guided exploration of Acadia, initiated and organized through online science-based social networks, is an extension of the park’s commitment to interpretation. Through strategic planning, the WPI team intends to develop Citizen Science activities that direct visitors to various under-utilized locations in the park in order to mitigate over-crowding and resource depletion that is occurring in the heavily visited areas of the park.